The next round for Anthem’s demo takes place this weekend and Bioware already have a bunch of fixes to go with it. Last weekend was the VIP demo where those who pre-ordered or have Origins Access could experience the sci-fi action-RPG. 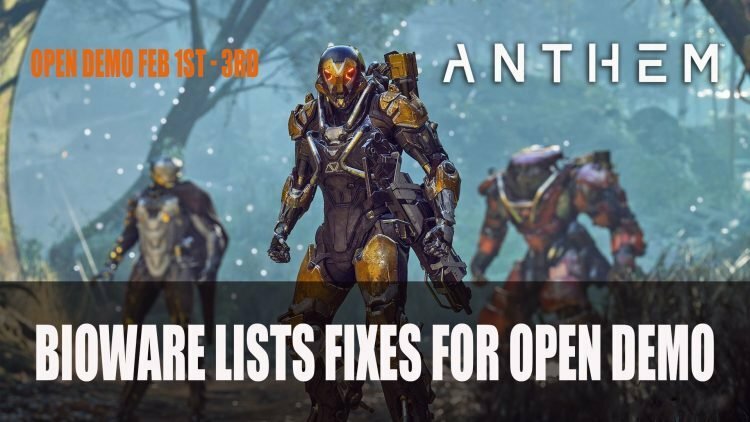 Before the public demo hits this weekend, Bioware have some fixes that will go live this weekend. The VIP demo had its share of problems, but Bioware and EA were able to give more stability to the demo so enough players could a have chance to try out the game. However, there were still some bugs which they are trying to address before the next demo. Bioware’s Head Live Service Chad Robertson also shared some interesting statistics about the VIP Demo. There was nearly 9 million hours of play across the the demo, 1 million strongholds completed and 2 million grabbits slaughtered. Anthem‘s Open Demo goes live this weekend starting Friday 1st until Sunday 3rd. If you want more Anthem content be sure to check out next Preview – Anthem VIP Demo to see what we can take away from the experience. You should also check out Anthem Producer Reaffirms Loot Boxes Will Not Be In The Game and Bioware Shares How Anthem Could Influence New Dragon Age And Mass Effect Games.